Preparing your heart for a pilgrimage! Jesus, Mary and Joseph went on a pilgrimage three times a year, in order to celebrate the Living God of Israel. It was a major event for the people and a very important "mitzvah" (commandment) for the Jews. From Nazareth, they had to walk about 100 miles in order to reach Jerusalem. They had to leave their daily habits, their schedule for prayer, work, relationships, and be kind of "uprooted" for a while. They never knew exactly what was in store for them on the way, but with joy they faced discomfort and tiredness. They were carried ahead by a wonderful goal: to pray in the Temple, "be seen" by God and fulfill His call! Each pilgrimage allowed them to reach a new height in their spiritual life. Pilgrimage is an adventure of the soul with several stages. Pilgrimage is the dream made true of a very exciting encounter with God! In a pilgrimage, you explore new ways, you discover new horizons, new people; you enrich your heart with special graces that God gives specifically for this occasion. During a pilgrimage, you allow God to be imaginative with you. Since you make the move to be detached from your comforts and normal frames in life – life’s mechanisms - God may surprise you. He may speak to you in a different, unexpected way. A pilgrim is one who decides to explore. As physical comforts wane and the daily, subtle addictions are not possible anymore, the pilgrim experiences an inner freedom that unveils secrets within his own heart. He realizes that he can live in a different way, with not much, and still be content. Often, when he finds himself blessing the distance suddenly put between his routine at home and this journey that escapes his control, for he experiences how blind he was and how much he needs to re-adjust the direction of his life. Time is given for consideration of his life from another perspective; what a gift this is! Like a plant that is moved to a sun-lit room developing new branches as a result, so the soul, being transferred into another context, reveals wonderful depths and hidden chambers to her outer self. God has always called his beloved children, and a pilgrimage is an answer to His call. He has many ways to call us but pilgrimages are obviously one of His favorite. From times of old, He set up places of worship in Israel and ordered pilgrimages to be part of the journey with Him. He calls us not for the sake of calling us, but because He has something beautiful prepared that He wants to share with us. Eighteen years of experience in Medjugorje has shown me that the best preparation for a pilgrimage to Medjugorje can be summarized in two actions: expect the unexpected and open your heart, then it will be in a position to listen to God's voice during your journey. Here are a few more pointers that will help us to live the messages in a deeper way while in Medjugorje. - We are invited by Grace so let’s not take it for granted! Our Lady said to the visionary Marija that those coming to Medjugorje on a pilgrimage are invited by Her personally. It gives us a clue as to what is expecting us! - Express to God and the Blessed Mother how grateful we are to be invited and thank them in advance for the graces in store for us. - Start reading a few of Our Lady’s messages from Medjugorje at home and prepare our intellects with documents about the apparitions or books holding testimonies, so that the basics are in our minds when we arrive in Medjugorje. - Make a point to be positive, to never complain and to gladly accept everything that comes our way. This will draw immense graces to us and those we carry in our hearts! The bed is not as good as at home? Remember that 25 five years ago the villagers didn't even think having a bed! The food is kind of strange? Remember that 25 five years ago the villagers didn't have enough to eat and had to work in Germany to ensure their families’ survival! The pansion has no air conditioning? Remember that Jesus never had any all through the torrid summers in Israel. The guide is this or that? Our roommate is this or that? Fine! Try to learn how to love divinely and overcome our natural emotions. I will ask my roommate about his childhood and welcome the beautiful child hidden within that person. A pilgrimage offers so many reasons to praise God when we could be tempted to grumble. A shower of blessings will then fall on us! Our Lady will collect from us all of these little sacrifices that we have made here and there and she'll use them for amazing graces! - Have the true purpose of your pilgrimage clearly etched in mind: Our Lady is inviting us to change our hearts and to change the direction of our lives. Because she loves us so much, her plan is our complete conversion! Let’s prepare our hearts for a good Confession, it may be the most important target we can hit while in Medjugorje as it purifies and cleanses that which blocks us from listening attentively to His voice! - Be sober and simple when packing your luggage. Many pilgrims arrive in Medjugorje so loaded with earthly things that they are also over-loaded in their hearts. A pilgrimage is an ideal opportunity to experience detachment and a certain poverty that is so good for the soul! Detachment allows the soul to be fully open to grace. Think of Jesus and the Holy Family, traveling by foot three times a year to Jerusalem. They were content with little and therefore experienced a great freedom. - “Open your hearts!” is the constant message Our Lady gives to pilgrims in Medjugorje. Let us be generous in what we allow God to change in us, for a pilgrimage is a special time when He speaks to our hearts, but according to the measure we offer Him out of freedom. - Absolutely avoid seeking signs and wonders. Those who seek them are not aiming at the right goal and will be very upset while in Medjugorje to see that the miracles happen on the inside. They will miss the special graces Our Lady had prepared for them and return home empty. - Clear all expectations before even leaving. Let’s keep our minds and hearts open to the Pilgrimage experience. If we let ourselves go and let Our Lady show us everything we came for (but couldn’t even conceive before we left) then surely we won’t be disappointed. - Be excited about having new friends, new brothers and sisters from the group! Very often, the new bonds of friendship that are created during a pilgrimage by the Lord are precious for our future. Our new found pilgrim buddies help us live the messages when we return home. We find that we have new supporters! Many little prayer groups and teams of charity work have been formed from being together on a pilgrimage! - Before leaving home, many petitions for prayer are entrusted to us from people we love, who are in need or suffer a great deal. Praying for them is a high priority. However, keeping our minds and hearts focused on this list of hardships will not help. The best way to support people in need is to unite ourselves with Jesus so much that we become filled with Him and radiate His light. Therefore, once in Medjugorje, instead of drawing in our mind an endless lists of intentions in order to present them to Our Lady, let's be at peace. Mary knows and loves those friends much more than we do! She knows our list before we start it. She could even tell us who we forgot to add on it! She said once, “Give me your worries, give me your burdens, then your heart will be free for prayer!” Then, let's entrust to her the whole package in one shot, trusting that she'll keep busy with our petitions and do a wonderful job for those we love. Let us be busy seeking unity of heart with her and with God through prayer. - If planning to buy religious articles, make a point to set apart a special time for shopping. If shopping preoccupies our thoughts everyday, we may be distracted and dilute the intensity of the grace being offered. - Be ready to see or not see a visionary, after all meeting them is not within our power. They have their own lives. Keep free of heart about human encounters because praying in Mary's Oasis of Peace is what will make us fully blessed! Since Our Hostess is Our Lady herself, we have nothing to fear or to be frustrated about. The Heavenly Queen will take care of all of our spiritual and material needs! She is thrilled that we have come to Her and She'll reward us! If we cannot see those we find most important, it is because She has another plan for us; She knows how to treat us the best. - Avoid bringing messages from other visionaries or other private revelations in order to fully benefit from the special gift Medjugorje is offering us today. It also spares our hearts from distraction and confusion. If you are offered to be prayed over, be careful! Make sure this person is under the care of the Church, since spiritual fakers are all over the world and may surely trick you with weird powers not from God that will harm you in the end. Actually, it is prudent to decline any of these offers, especially those having to do with health. What to put in your suitcase? A book with Our Lady’s messages, (pick one up ASAP if you don't have one already)! A notebook for the things you'll have to remember. A pair of shoes for climbing mountains. A flash light if you climb at night. If you have medicines or precious items, keep them in your hand-luggage when you travel, just in case your checked luggage is delayed. 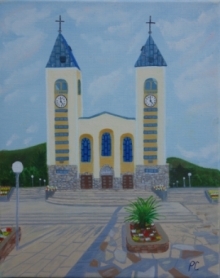 As for money matters, dollars and euros are accepted in the Medjugorje market. You don't need to change them into local KM. It is prudent to take some cash and not only Visa cards. If you feel called to give something to the locals or to an organization in Medjugorje, pray to Our Lady that she points out to you the real needs. - A last piece of advice: Before leaving Medjugorje, consider writing a love letter to Our Lady! May we just pour out our heart as it truly is. We may hand this letter to a visionary (at Vicka's for example) or to our guide, or put it in the special basket for petitions at the Information Center. Our letters will soon be placed at the feet of Our Lady during an apparition.